Tumor immunotherapy, which is widely used as a fourth treatment method after surgery, radiotherapy and chemotherapy, is a major turning point in cancer treatment. Chimeric antigen receptor-modified T (CAR-T) cells are an adoptive immune cell therapy technology that has developed rapidly in recent years. CAR-T cell therapy is a novel treatment for the processing of T cells and expression of the relevant chimeric antigen receptor (CAR), which is returned to tumor patients and kills antigen-related tumor cells. Through genetic modification technology, the targeting, killing activity and persistence of effector T cells are superior to conventional immune cells. 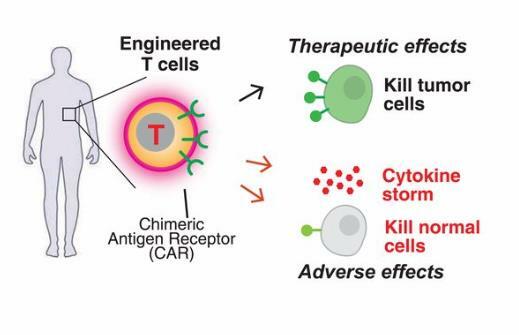 In addition, CAR-T can overcome the local immunosuppressive microenvironment of the tumor, break the host immune tolerance state, and be the field of tumor immune cell therapy. At present, the clinical research on CAR-T cell therapy mainly focuses on hematological tumors such as relapsed and refractory acute lymphoblastic leukemia and chronic lymphocytic leukemia, and related basic experiments and preliminary clinical studies in solid tumors such as pancreatic cancer and lung cancer. The biological properties of CAR-T cells is consists of an extracellular antigen binding region, a transmembrane region, and an intracellular signal transduction region, wherein the extracellular antigen binding region is composed of a light chain variable region (VL) and a heavy chain variable region (VH) derived from a monoclonal antibody, and is joined by a hinge region to form a single chain antibody. CAR’s scFv is mostly murine, but human-mouse chimeric scFv or whole-human scFv is more effective than pure murine scFv, which increases the affinity of CAR to ligand and reduces the adverse reactions of heterogeneity of murine monoclonal antibody. The transmembrane region of CAR-T cells is generally composed of homologous or heterologous dimeric membrane proteins such as CD3, CD8 or CD28. The resulting signal through the dimerization of CAR and interaction with endogenous T cell antigen receptors (TCRs) promote T cell activation, and its linked signal transduction region plays an important role in the proliferation, survival time and anti-tumor activity of CAR-T cells. After the introduction of costimulatory molecules, CAR-T cells have significantly prolonged survival time in vivo and the anti-tumor effect was also significantly enhanced. The scFv that will recognize tumor-associated antigen and the intracellular signal domain, such as an immunoreceptor tyrosine activation motif, are genetically recombined in vitro, a recombinant plasmid is constructed, and T cells are transfected in vitro, and CAR-T cells having specific recognition of tumor antigens and killing tumor cells are obtained by culture. Although cancer treatment of CAR-t shows significant therapeutic effects, there are also some problems in the treatment of CAR-T cell, such as some patients need to wait for longer CAR-T cell culture time, thus losing treatment opportunities; some unique adverse reactions during CAR-T cell therapy even endanger patients’ lives; the efficacy of CAR-T cell therapy on solid tumors is not satisfactory. Even for hematological malignancies, some patients will eventually relapse and lead to treatment failure. Therefore, exploring the methods to improve the efficacy of CAR-T cells, timely discovering the adverse reactions of CAR-T cell therapy and giving appropriate treatment, and expanding the possible benefit of CAR-T cell therapy are the problems that CAR-T cell therapy research needs to solve.